It’s one of our greatest joys at Roadburn to be able to bring you special sets and exclusive collaborations over the course of the festival. Today we have one to announce that is presented with somewhat heavy hearts. On Saturday, 21 April, Stephen Brodsky and Adam McGrath will unite to play a very special set at Het Patronaat in honour of Caleb Scofield, their long time bandmate, collaborator and friend, who sadly passed away last month. We, at Roadburn, are honoured to be able to host such a special tribute to Caleb – a musician who not only performed at Roadburn himself (as part of Old Man Gloom in 2014), but whose influence can be seen in many of the bands that pass through Please note that entrance will be on a first-come-first-served basis; doors will open at 12.30 and the performance will start at 1pm. 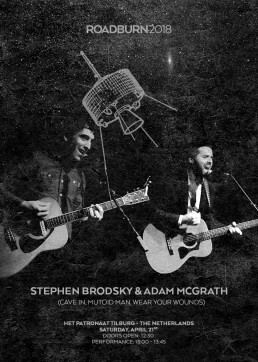 Stephen Brodsky and Adam McGrath will play on Saturday, April 21st at Het Patronaat as part of Roadburn 2018.